I don’t know if you know this about me or not since I hardly ever mention it or at the very least I haven’t said it in the past five minutes – but here it is: I LOVE SUNSHINE!!! I have decided that I need large doses of vitamin D in order to avoid all kinds of conditions and disorders. Bring on the hot, bright, beautiful days of summer! 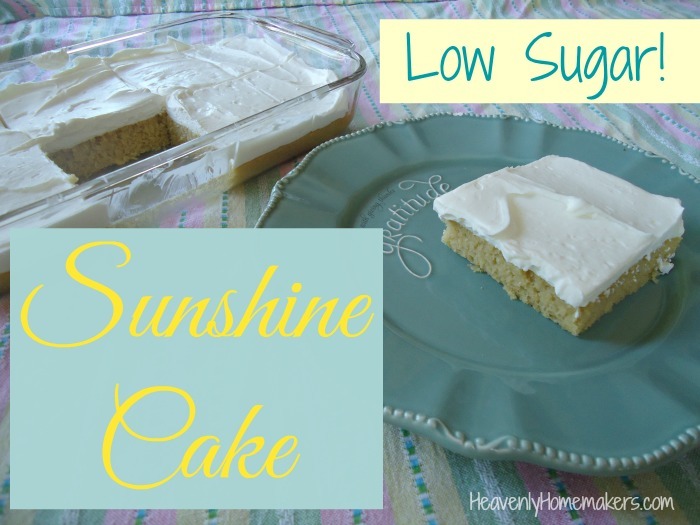 My love of sunshine along with my love for this cake led me to call this recipe Sunshine Cake. Indeed, that’s exactly what this tastes like: a delicious drop of sunshine. What does sunshine taste like, you ask? Well, it tastes like this cake. Do I need to keep explaining this? If you can possibly believe it, I think I like this cake even better than the Low Sugar Super Moist Chocolate Cake – and we all know that I love that cake almost as much as I love sunshine. Just like the chocolate cake, two key players in this recipe are whole wheat pastry flour and sour cream. The pastry flour helps this cake remain light, and the sour cream keeps it moist. But let’s not forget the Cream Cheese Frosting. It goes without saying that Cream Cheese Frosting makes everything in life better. Even cloudy days with no sunshine. Add milk, sour cream, melted butter, eggs, and vanilla. Mix with beaters until smooth. 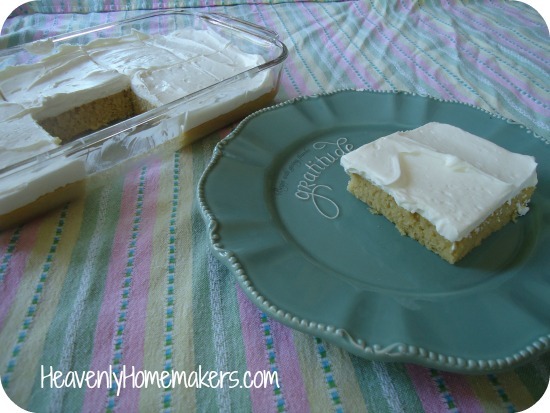 Pour into a buttered 9x13 cake pan. Bake in a 350° oven for 25-30 minutes or until a toothpick inserted in the middle comes out clean. In a large bowl, whip cream until soft peaks form. Add softened butter, cream cheese, vanilla, and stevia – whipping until well combined and smooth. Spread over cooled cake. Store in refrigerator. With a hand mixer (or in your blender), whip together all ingredients until smooth. Spread over cooled cake. Tell me which Low Sugar recipes you’ve tried so far. Which are your favorite? Are you a chocolate or a vanilla kinda friend? Add a citrusy extract to this, no problem! Yummy idea! DEFINITELY expected lemon. I’m a chocolate or lemon or strawberry over vanilla person. I like to lemon flavor with lemon juice verses lemon extract or oil. How much would you suggest for thus cake on lemon juice? Or would you have to up the sugar some? I wouldn’t up the sugar, but you can add 1-2 teaspoons of lemon extract. I love the sunshine, that adorable plate, and your healthy cake recipes, Laura. And you’re right – cream cheese frosting does make everything in the world better. Thanks for the recipe. I made this for the 4th, added a little coconut sugar to sliced strawberries and blueberries and topped each piece of cake individually to avoid soggy pieces. It plated nicely in all of its red, white and blue glory! My husband did not like this cake. I am neutral. My kids liked it. The texture is not like a standard yellow cake. The texture of the cake I made it similar to a pound cake. I beat it 2 minutes which is the same time I beat a yellow cake with white flour. Maybe I should shorten that time for whole wheat pastry flour? The taste is ok. I used the maple cream cheese frosting and had to add a little heavy cream to have enough to spread. The taste was good. I doubt I will make this cake again. Off to the chocolate cake!